Use UNSPSC to map purchases to your ERP. Reduced item setup in the ERP. A more interactive shopping experience. Eliminate manual replication of data already entered into the supplers website. shop and add items to the cart. check out and have all of the items from the cart automatically transferred to the purchase requisition in the ERP. This sounds great! And it is. However there is a problem. How do you ensure that all of those items purchased are categorized properly in the requisition and the following purchase order? Using SAP Business ByDesign in our example, if we do not set up every item that can be purchased from a vendor, then we need to at least set up the categories of items to be purchased and associcate them with appropriate cost objects. However Business ByDesign limits the setup to a single default product category for all purchases from a site. Enter UNSPSC or United Nations Standard Products and Services Code®. Most suppliers (e.g. Office Depot) adhere to this standard to categorize the products they sell. The benefit of the UNSPSC is that it is a standard ensuring that products purchased from multiple suppliers are consistently categorized. Therefore it would be most beneficial to map the UNSPSC from the punchout catalog to the ERP product category. This would ensure uniform categorization of products purchased from multiple vendors without the need for manual coding. Our firm was tasked with setting up an integrated punchout catalog for Office Depot in Business ByDesign for a client. In discovery we noted that there was an extremely high volume of purchased from Office Depot spanning many product categories. As stated above, we are limited to setting a single product category for each external Catalog in configuration. The Office Depot implementation of the UNSPSC was a total of 1600 product categories. For example, 67 product category codes related to paper products ranging from 14111502 through 14121901. However these 67 codes could be contracted to either one code 14000000 - Paper Materials and Products or 2 codes: 14110000- Paper Products and 14120000 - Industrual Use Papers. In essence, using the 2 digit Segment Code would result in a total of 39 Categories and using the 4 digit Family Code would result in 163 Categories. 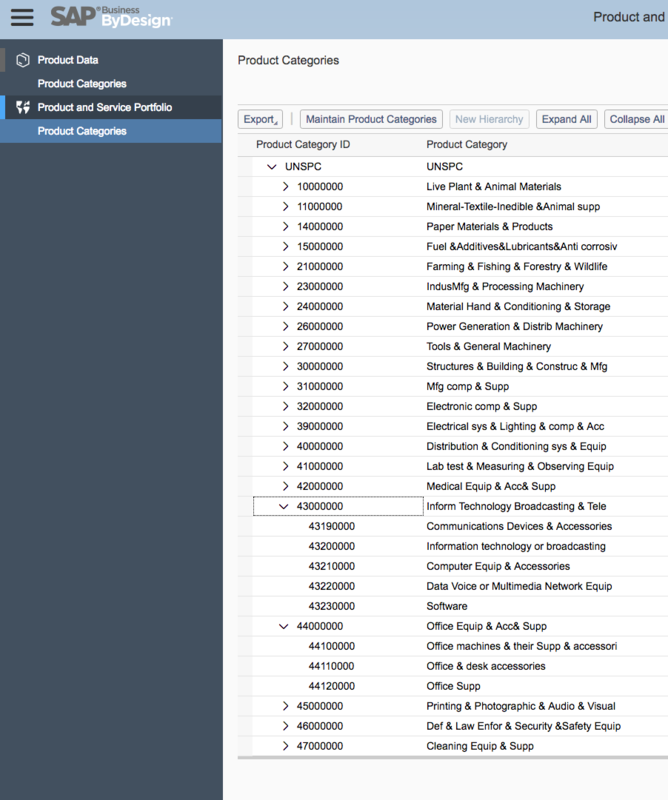 We decided to base our product categories in Business ByDesign to the UNSPSC family code for the proper balance of purchase spend categorization. It is important to remember that this is a one time set up that can be used to uniformly categorize purchases made from multiple punch out suppliers in an automated fashion. The result is consistent categorization of spend and removal of the burden of account coding from shopping cart users who would not be familiar with the proper coding. Also having more detail categorization of spend in the procurement part of the sytem will provide for very valuable analysis. import the appropriate UNSPSC codes to the Business ByDesign product categories and map them to the appropriate account determination group. Have the punchout vendor map the UNSPC codes associated with each product to the family level when providing the punchout feed. Office Depot did this by replacing the last 4 digits of the 8 digit UNSPSC with zeroes.